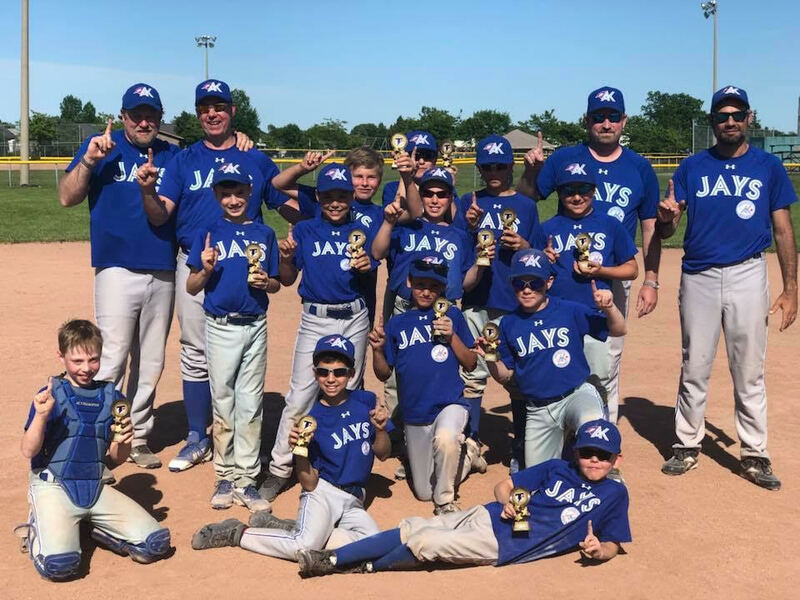 The AA Aurora King Jays Mosquito team defended their 2017 title, going undefeated for the second year in a row at the Kingston Thunder Mosquito tournament on June 8th-10th. The team’s 3 straight wins in the round robin positioned them well for the elimination rounds. To kick-off the round robin on Friday night, the Jays beat North Toronto 14-1. Saturday saw two more wins with the boys beating the host Kingston Thunder 21-9, followed by an excellent come from behind 6-5 win over the Seaway Surge to secure the 2nd seed for the quarter-final round. Saturday night saw the Jays cruise to a 14-4 win vs Cambridge in the quarter-finals. On Sunday in the semi-final, the Jays held on to beat Kanata 15-9. The team followed that up later on Sunday afternoon with a resounding 14-2 victory over the Bolton Braves in the finals, in what may be the most complete game this team has ever played. This tournament victory was a complete team effort that saw key contributions from all 12 players at varying times throughout the weekend. By Sunday the defence was bullet-proof, the offence was firing on all cylinders, and the pitching was lights-out. Overall this was a fine weekend of baseball by a great group of boys. The team would like to thank their sponsors, families, and fans for their support all weekend in Kingston and throughout the season so far. External links are provided for reference purposes. Aurora King Baseball Association is not responsible for the content of external Internet sites. Copyright 2019 by Aurora King Baseball Association Inc.